The death toll of the latest Israeli military operation in Palestinian Gaza has soared to 121 Palestinians. These Palestinians aren’t the ‘terrorists’ Israel is aiming to target; one of Israel’s airstrikes hit an NGO working for handicapped Palestinians, killing three handicapped patients and a nurse. While, of course, Israel will justify this latest crime by claiming it only ‘retaliates’ for the 680 rockets it says have been fired from Gaza. In fact, in a new level of incredibly twisted politics, the British prime minister, David Cameron, and US president, Barack Obama, have made statements of irrevocable support of the Israeli operation, with Venezuela and Scotland being the only two countries in the West to have publicly condemned Israel’s actions. International organisations as prominent as the Arab League and the United Nations have been completely ignored in their pleas to stop the violence by Israel and the West, although if the same UN were to publish a report on human rights abuses in Iran the United States would suddenly start pushing the Islamic republic to comply with this realistically weak organisation’s demands. Of course, all these countries forget that the crisis in Gaza has made emotional waves across Muslim communities globally, and the Muslim ‘retaliation’ would not only be wider and larger than the mere explosive rockets being fired into border Israeli towns, but also more dangerous for all of us. In a heroic display of unity, multiple Muslim countries that have access to Gaza have pledged assistance in various ways. Malaysia is sending 40 doctors as much-needed medical aid for the 920 injured, the United Arab Emirates has pledged 100 million Dirhams for Gaza and Egypt is currently assisting desperate Palestinians to escape into Egyptian territory. Meanwhile on Facebook, many Pakistanis are busy glorifying Hitler, the only European it appears Pakistan is satisfied with. Not because Hitler somehow created the ideal Islamic caliphate, strangely enough. 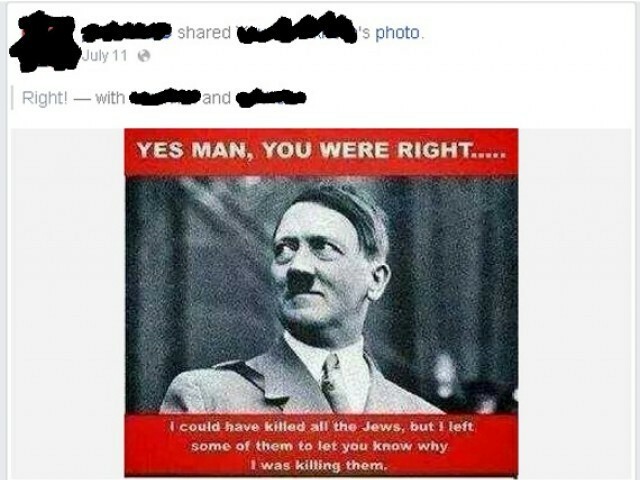 It’s because Hitler killed Jews, “and would have killed them all” if he had won the Second World War. Of course, we can all conveniently forget that Hitler’s Holocaust was the primary reason Jews were uprooted from Europe and were forced to find solace in a homeland they had never been in for hundreds of years. We can also conveniently forget that Hitler killed 11 million human beings, of which six million were Jews. His Nazi ideology didn’t rise to safeguard the interests of Islam or Palestinians in the 1940s, as some of us want to believe; his ideology wanted Aryans to be the only surviving race in the world and establish racial purity. That meant killing everyone who wasn’t an Aryan – a perfect Aryan. Russians, Chinese and African workers, the disabled and the mentally challenged, Turks and Mongols, homosexuals and communists were all among those gassed in Nazi concentration camps. While yes, we South Asians and our Persian brethren were lucky enough to be classified as ‘Aryans’, our Arab and Malay community, the largest Muslim racial group, were part of Hitler’s ‘vermin’. Even a large part of modern Pakistan would have been exterminated, as only ethnic Tajiks were given the Aryan blessing by the Nazis while the rest of the northern people, including the Pakhtuns, would’ve been dead today. All of us cringe at the devastating list of the dead in Gaza with their names and ages revealed by Al Jazeera. Are we so inhumane that we cannot feel the same for Hitler’s victims? That we must elevate a butcher to a martyr? What about the two Bosnian women who helped Jews escape Europe from Hitler’s clutches because of their blood? What about the Turkish diplomat in Rhodes who tried to save 5000 non-Aryans from extinction, only to see his pregnant wife, Mihrinissa, die in Nazi retaliation? It is a shame that while the rest of the Muslim world compares Israel’s actions against Palestinians to Hitler’s against the Jews, all we, as citizens of the first model Islamic state, seem to be doing is glorifying the very same actions in an even worse depth and shaming the very conscience of Islam in front of the world. It is a shame that we are praising the man who today inspires neo-Nazi attacks against Muslims across Europe. If it is truly Hitler’s actions that are to be praised in the Pakistani perspective of things, then we should wear our media label of being international terrorists with pride. And remember my fellow countrymen – liking Nazi statuses isn’t going to ease the suffering of Palestine. As much as we fume about the rich Gulf Arabs and too liberal Malaysia and Turkey, don’t forget that they’ve done more for Gaza than your profile picture ever will. Pakistan is a den of Ignorance and Ignorance is a bliss in our country. Hitler killed not only Jews but many Others as well. He have killed one million Romas only because they dont look white and looked like Pakistanis and North Indians. But what we can say about Pakistan where everything is controlled by Mosques and the narrative in Friday Sermons is simple that Hitler suddenly became the hero of the ignorant Pakistan. A film fanatic who can’t stand nationalism over liberalism, or conspiracy theories or secular facism or religious fantacism. self hatred, talking about UAE and others donating, And then Paks seem to be mostly glorifying Hitler. What a monumentally nefarious and sinister statement. Egyptians were doing the exact same thing, on a much, much bigger scale. It was even on their tv channels. Even then, so what if certain Paks decide to admire Hitler, the RSS and hundreds and millions of its followers have been doing it for years across the border, and continue to do so. I wont see you condemning them. Try it, and see what happens. Have they stopped the bombings? Have the trillions of dollars in armament purchases by the gulf arabs and turkeys nato membership done anything to stop Israels bombardment? NO. I see Amir Khan, a person who is recognized as one of the elite athletes in his sport, (something no Turk, Malay, or Gulf Arab has ever accomplished in the sport of boxing), using his status to create a lot of awareness about the issue, potentially sabotaging his own career in the US by talking about ending the gaza crisis, and freedom for palestine. Most athletes tend to stay neutral when these sorts of things happen, and wouldn’t risk it. So enough about alluding to the incompetence of Pakistanis, which is the main theme of this article. Its only countries like Iran who have done anything of serious note for the people of Gaza, in the face of overwhelming military aggression by Israel. Israel is behaving just like Hitler, those supporting Israel are just as “bad”, as those looking back and admiring Adolf. Malaysia is liberal? haha, Remember what MAHATHIR (the guy who basically took Malaysia to where it is today) said about Jews? Has any Pakistani leader ever said anything of the sort? And dont get me started on how people are admiring hitler over there too, on FB. Its happening, believe me. Same with Turkey. You are wrong!!! Pakistanis are not Brown, perhaps Muhajirs, but pakistani are brown. Most Pakistani from KPK & Azad Kahsmir look like caucasian. Punjabi are mostly descendent of Afghans and Turks and Most Sindhi and balochis are descendants of Arabs liberated by Mohd-Bin-Qasim. an article written in excellent manner…… unbiased !!!!!! The largest ethnic group in Pakistan is Punjabi. They’re the model brown people. The second largest ethnic group are the Pashthuns. If you think they look Caucasian, either you’ve only looked at brown people in your life or never been to Peshawar, because Pashtun people are still fairly brown. The Sindhis, the Mohajirs. Yep, brown too. Hazaras and Uzbeks? Yellow. But we don’t like em. The only “white” people in Pakistan are the Tajiks and the Boroshos, and they’re so way up in the north nobody cares. So yeah, Pakistan is brown. Hitler would have screwed us too. Umm…did you skip the part where Hitler kills the Turkish diplomat’s wife and the Africans and the Chinese and the Mongols? And the mentally challenged and the disabled? And oho, all he wanted was to make Germany white. Poor misunderstood guy. That must be why he invaded all of Europe and killed non-whites in all of Europe. And he spoke for the Palestinian cause. Must be because he was a noble man at heart even though he killed 12 million people. Accidentally I guess. Even though he was a politician and uff, those guys are the most honest and innocentEST individuals the world can ever bless us with. Even though he secretly wanted to rid the world of all Arabs too, after he was done with the Jews. Hitler is our hero, try to read alterante version of history and not allied propaganda they do to justify nuking Japs. And what were british and french were doing when Hitler attacked them. They were paragons of peace or protectors of BROWN PEOPLE??? British and French had colonized and humilated whole of middle east and India. Hitler was the catalyst that helped free the world, but due to him losing to Russians , british were able to plant illegal JEW population in the heart of middle east and then gave them nukes. KID stop watching HOMELAND and read something about history. and exterminated you on the spot ……you still want to hail him ? What really bothers me is that you see the presence of Hasidic Jews in rallies supporting Palestine and yet these ignorant and hateful bunch uses Hitler to antagonize *all* Jews. 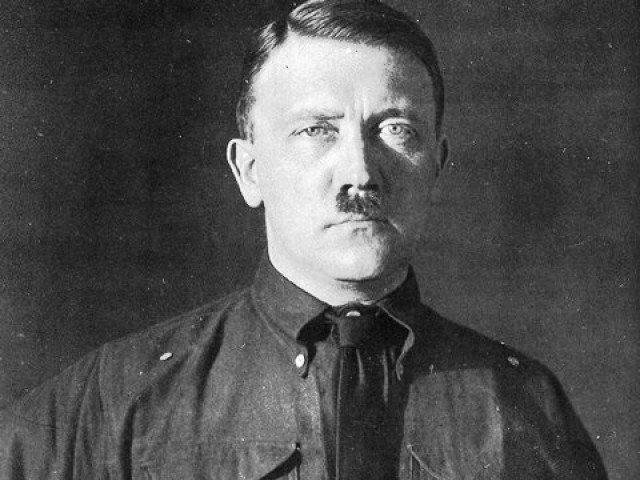 Hitler considered some brown people from the Middle East and India Aryan as well.